I'm trying to learn how to program my device to use TWI interface to read from my board temperature sensor and there are some settings I can't decide which options to set on their registers, so I need some help clarifying these settings meaning and what they are used for! I'm using this AVR IoT WG board which uses an AtMega4808 and the temperature sensor is an MCP9808. AtMega4808 User Manual I'm using is here and MCP9808 datasheet I'm using is here. I'm using MPLAB X IDE v5.15 and AVR Toolchain v5.4.0. I'm on Debian 9.8 (Stretch) 64 bit, if this matters! The goal is to setup TWI interface to read temperature from this sensor. The first thing I did was start reading Mega4808 User Manual at the TWI section, starting at page 334. Then a bit further they talk about the interface initialisation where is said that properties SDASETUP and SDAHOLD must be set before initialising the device. I didn't know what these 2 settings meant so I went to search about them. The problem is that even after I read about them I'm still not sure what to set for these 2 settings. I have searched both documents and found timings tables of both devices and that these tables might hold the answers but still I'm not sure what to choose. Is it reasonable to assume that if I choose Mega4808 option 3, 0x2 (300ns nominal - 180-630ns) I'll be ok for this setting? Or is it better to choose option 4, 0x3 (500ns nominal - 300-1050ns) ??? And also for SDASETUP I have no clue what for is it used for! I also need clarification for that setting, please! Well, regardless of this, I need to try to continue! I chose here the 4th option. I'll change it if needed. Now, I keep reading and they say that I should set the Baud rate in TWIn_MBAUD register. So I assumed a random value of 100KHz which is inside the range of the Slave device (0Hz up to 400KHz in its Datasheet). When I search for this register, I see this is an 8 bit register, so I can't write 100KHz there. Then I read there that "For more information on how to calculate the frequency, see the section on Clock Generation". When I search the User Manual for this section and start looking for TWI Baud Rate frequency calculation I can't find anything but USART related stuff and Synch Modes and Asynch modes, etc, etc! So, I'm clueless about what to do with this MBAUD register I need to set! There is more then one datasheet (manual) for this part, a generic family DS, and a specific part DS (28, 32 or 48 pin part), You need both (all) of them. While your at MC getting those, also get the app notes as well, you will need the TWI one specifically, but might as well get the rest. I have the links in my 1st post to the documents I'm using! I'm using the datasheet and the user manual of AtMega4808 and MCP9808 temp sensor! I found what they mean about "Clock Generator" section. It's in page 344 and the formula I need is there but now I need to know about tRise and I can't find clear info about this value that I need to evaluate the BAUD value I need to set TWI0.MBAUD register! That MCP9808 table can be pretty much ignored unless you try to run your serial at the very fastest possible speed. YOU have no control over those parameters, and you have scant choice on the master. Simply, set the master hold time long enough. Compare the timing diagrams of the master and the slave to figure out what you really need. Ok, I have some questions I can't answer by myself regarding this TWI operation, specifically when it comes to this chip Mega4808. I know there is a sequence of events during a transaction of a packet. But I'm finding hard to understand and confirm my reasoning is correct or not when I try to write my functions to deal with Start Bits, Stop Bits, Hold Times, etc. 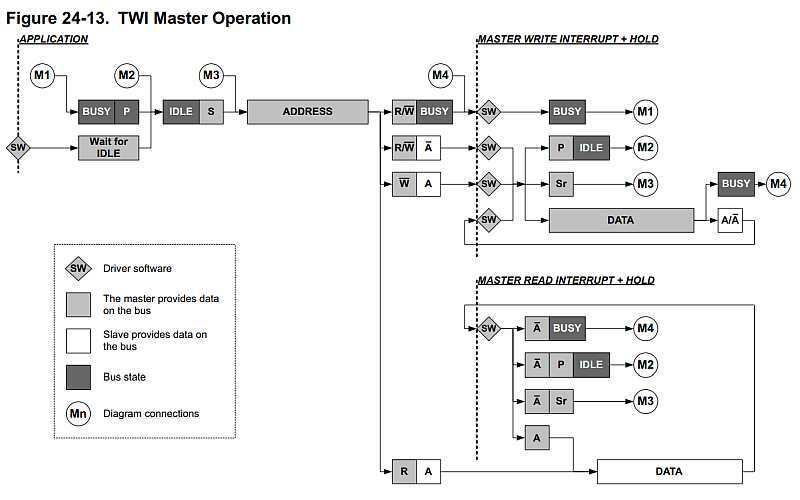 When the User Manual says Master Operation and Slave Operation, I'm not sure what this means. I know that usually, in my case, the Mega4808 is the Master Device and the temperature sensor is the slave device and in my mind, Master Device will need to read values from the temperature sensor. So I cannot decide if this is a Master Operation or a Slave operation because both devices are working together. Master is asking for data and Slave is providing that data! The question is in what context this Master and Slave operation comes in? Why there are both operations and when one happens and when the other happens? Then comes some more specific questions. I know that there is a specific time that SDL and SDA lines needs to hold to be able to some specific situations to be detected and confirmed. And at the beginning there was this setting I set named SDAHOLD which was 500ns (option 0x03 below). 1 - Is this SDAHOLD setting the one needed, for instance, for detecting a START Condition and/or STOP Condition? I mean, does the SDA Line needs to be at level 0 (after the transition from level 1 to level 0) for 500ns while SCL is also level 0 for a Start Condition to be confirmed? Or is this setting unrelated to this? 2 - If answer to the above question is "yes, it's related and 500ns are needed to a Start condition is detected and confirmed", how do I make it wait 500ns? Do I need to write my own delay function or can I use the _delay_xx() functions? Not sure why your worrying about this, the TWI hardware will handle this, I would just take the default value and go on with the project. Are you trying to trouble shoot some issue with the I2C comms or just trying to understand the details of how it works? I think that a big part of the issue is that the new Mega0/1 devices have more control over TWI timing than we are used to with the "old" Mega/Tiny family. Note reference to SDASETUP & SDAHOLD in TWI.CTRLA in the quote in the initial post. Nothing like that in a standard Mega! Frankly, I don't think any of us have direct experience with this. Yet. It is going to involve direct analysis of the timing diagram of the peripheral device(s), the timing diagram for the TWI port, and the timing table in the TWI documentation. I suspect that this will mostly effect operation at the maximum possible speeds. Someday, in the not too distant future, I'll have to go through this exercise, myself. Until then, I plead ignorance of the facts. I think I understand the general concept of how TWI works but the details are killing me. As you can notice I'm not experienced and therefore I'm struggling to understand the settings and what they do! For instance, I know that SDAHOLD is a some setting that defines the amount of time that one line needs to hold a certain level before it can change to detect and confirm some specific action. But my struggle is that I don't know what for is this setting needed and if this setting is to automatically avoid the user to be worrying about timings. Then I know that the hardware needs to hold the SDA line for some time while SCL is low so that this condition is detected and confirmed as being a Start (or Repeated Start Condition) but I don't know if I need to manually write a delay function for this or if that SDAHOLD setting takes care of it automatically! Indeed... This header file and the way microchip guys did this is way different from the usual stuff! It says there that when this bit field (I would say byte field), a Start condition and an Slave address protocol is initiated. So does this means I don't have to worry at all with Start Conditions? And then that I only need to check for the ACK response to continue with the code? You might want to get a traditional mega (328 on Arduino would be a good, cheap, easy choice) and do TWI on that first. It is the "minimal subset" and shows you the core basics which are the only stuff you need really understand. It's a bit like doing ports and pins. Those traditional AVR only have 3 registers: DDR, PORT, PIN and that's all you really need for IO. Then look at the Xmega derivatives. The ports have 10 or more registers for things like OUTTGL and so on. This adds all kind of additional stuff but it's really all just eye candy. You can still run a port using only PORT_DIR, PORT_IN and PORT_OUT. 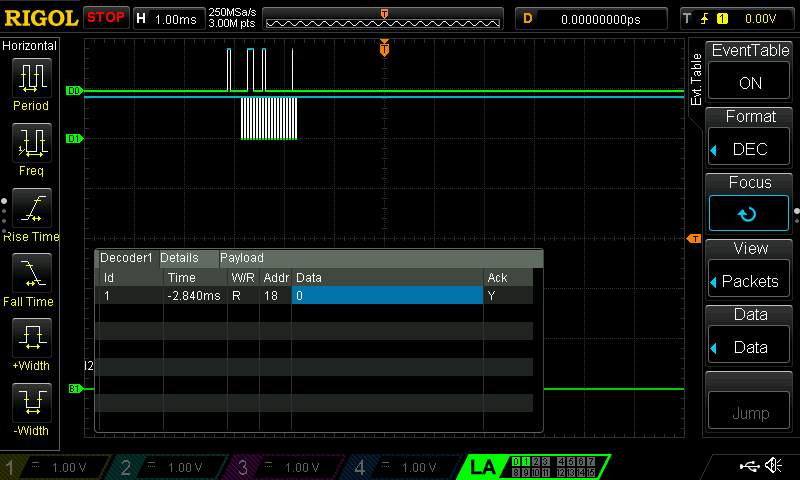 Looks like I2C is the same. They've thrown in a ton of eye candy with SDAHOLD and so on but you don't have to understand/use that (except that the one that says "backward compatibility" probably sounds good!). In short you are confusing yourself with stuff you don't need. Having said that, TWI/I2C is always going to need some kind if "addr" register. You'll find that in the simple 328 just as in this massively complex chip. Clawson, I have already did this in AtMega328 in the past. I did it for learning about TWI by storing and reading simple values from an external memory chip. Here the problem I think it is the fact that I don't know that much about TWI and Mega4808 that allow me to understand the User Manual instructions. And adding to that, seems to exists many new features that I don't know if I need them. I'm ok with the eye candy way of microchip doing things and writing the header file because it's been easy ti find the register's names and by what is said in User Manual. That is the least of thr problems. I gave the example of SDAHOLD that I read about what it is but I have no clue how to reason the option to choose in my case. And yet about Mega328, because it is a more simple chip, datasheet ends up more easy ro understand. They ezplain things in a more linear way. I mean, chronologically speaking, is way easier to understand. They start in the beginning and go until the end without the need of explaining other things in the middle. Here, for Mega4808 they explain each feature but not like they organize explaining for TWI frim beginning to end. They explain featur 1, then they explain feature 2 and after they explain feature 3, but not that things needs to happen in the code by this order. That is a problem to me. I'll posr the code I have. Maybe you guys can help me from there. | TWI_SDAHOLD_500NS_gc; // SDA Hold time - Meets SMBus specifications across all corners (0x03) ??? Ok, I sent a support ticket to Microchip about the TWI interface and if it was possible for them to create a basic example guide on how to configure TWI for AtMega4808. They told me there is a document I could use to try to figure it out because registers were written in the same way as for AtMega4808. This document purpose is a little different from what I need it for but still is something. This document describes, if I'm not mistaken, a bootloader operation using TWI but in Slave mode! So I started looking into the project files and I see that even if that is a basic and simple example, I think it's still a little complex to start with because they handle collisions and other stuff I was not interested in yet! And they are also using structs and enums to create data types that maks it a bit harder to "decode" so to speak! Ok it may be a bit more intuitive when you get used to it but for now it's not very user friendly yet (at least for me). Anyway, I still tried to see what is happening at least inside the function that initialises the TWI interface and I might not be that far from what it is needed. So, anyone willing to help me to go through this code and write my own code (an even mor simple version of this code just to make the TWI work)? There is ONE thing that catches most new TWI/I2C users and even some of us who have used it before. That is the matter of address. There are SEVEN true address bits and one read/write bit. Some peripheral vendors give you the 7 bit address, often disguised in hex so that it is not obvious that only 7 bits are involved. Then, YOU have to supply that 8th bit according to the operation you want to perform. Other vendors give you TWO addresses as read and write addresses. When you look at them, they differ only in the LSB. These are full 8-bit addresses. The full I2C manual from NXP works in terms of 7 bit addresses. The peripheral spec sheet often is not very explicit about this, leading to confusion. At the master end, you are simply provided with an 8-bit address register. If you have a 7-bit address for an AVR master, you MUST left shift it by one bit and add in the read or write "address" bit in the LSB. If you have an 8-bit address, just load that address into the address register without any shifting. Now what I want is to try to use those 2 functions to try to build my own for my device! In the meantime, someone has succeeded in programming TWI-Master Mode functionally? Since current datasheet does not seem flawless and there is no "Getting started with TWI" or other helpful code regarding this mode I hope for some practical help here. If you have a 7 bit address, you have to shift it left by 1 bit before combining the read/write bit with it. I got closer today. Bed time now. 3am here. I'll report here tomorrow if I get it done. Well, that's what I just learnt today from an IRC friend that taught me that. I changed it and i can see it's now correct, at least for the address part. I can see it with my scope I2C decoder. I'll try to keep going tomorrow and figure out how to read temps from the sensor. I think I'm close. I'll state here the point where I'm at! I'm trying to make 256 temperature reads, sum them and average the value. Then I send that value to my board USART2 which heads to my laptop terminal (supposedly). I have created several functions for the TWI implementation and for the USART device. The code for the USART device should be working because I've used it before in another example project I made. For the TWI implementation I created a function to initialise the device, another for a Read operation and few others but I'll only discuss about the Read operation function because it's the one I'm working with. This TWI_Read() function, receives the Slave address and a couple more parameters. I'm still not going to discuss if this function is the best one or not. It's not but the concern here is to make it work. So please do not lose focus trying to improve the function structure or the way it was created because that's not the point for now! I'll improve it when I know the important code is working! I have one version of the code where I can see that the Slave device ACK its address. I see it in scope. I'll post a screen. This version, in my opinion is not the best because I'm sending the address of the slave device in each read operation and I think it's not needed or intended to be like that, so I tried to change the function and everything breaks a part! I'll post now the main() function and the TWI_Read() function that is kind of working but I don't agree with it because I'm sending the Slave address every temperature reading operation. I think this should not be like this! But this last version shows nothing on scope! If anyone can help me figuring out why, it would be awesome! Thanks for your code. Could you add TWI_Init() too? Sorry I'm not C expert enough to find out your bug quickly but I was now able to create an interrupt-based, working TWI-master implementation in assembler (tomorrow @ projects). | TWI_SDAHOLD_500NS_gc;    // SDA Hold time - Meets SMBus specifications across all corners (0x03) ??? There are settings that might be not needed due to the fact that their default setting might be the one I'm setting there, but I used them anyway to prevent that I miss any more details! I'm having more issues now with another setting that I decided to change. The Serial Port Clock Frequency says up to 400Khz so I decided to change the Master Device main clock frequency from 20Mhz to 20Mhz / 64 = 312.5Khz which is within Slave device range. But the formula that my Master device datasheet says to use to evaluate this MBAUD value and that returned a value of 95 when I did the math for the first time assuming an f_SCL freqeucny of 100Khz is now returning a negative value for 312.5Khz. So, the first time I used this formula I assumed an f_SCL= 100Khz, f_CLK_PER = 20Mhz (default Master device main clock frequency) and T_RISE = 2.5ns also from my Master device datasheet. But now, I used a prescaler to bring my Master device main clock frequency to a value which would be within Slave device SCL frequency range. So I chose to use a 64 prescalor factor. This is not reasonable and at this point I don't know what makes and what doesn't makes sense! This should not be necessary since twi configures pins itself. Can you also check about the latest problem I stated about the frequency setting? I remember reading somewhere not every BAUD / fCLK_PER value is allowed... The amount of configuration options is limited. I remember reading somewhere not every BAUD / CLK_PER value is allowed... The amount of configuration options is limited. So how can I possibly check that? I don't remember of reading anything like that in the datasheets I'm using. I'm trying another version of my code. I have worked around the f_SCL frequency and BAUD value and tried to send the address and read a single byte of data, then send NACK from Master and issue a Stop_Bit() and check what shows up on scope. 1st - I can't activate the Env. Table that shows the decoding results, if applicable. MBAUD = (fCLK_PER - 10*fSCL) / 2*fSCL. This formula is sufficient in practice, fCLK_PER * TRise (<1) mostly not significant. I was about to believe you but the fact is that the frequency was matching the math on scope so I was wondering and was about to check again the formula and eventually try to change the formula parameters to see if anything would change. Then the next post confirmed that actually I used the correct parameters! Thanks for confirming. In fact, the scope was confirming because the frequency is matching the math. But after all, my code is still not working. I would need some help to try to figure out why. I could post here all my code but to b honest the code tags are not very friendly so I was thinking about to create a Git repo and everyone could see and change the code. I have one version of my code that is partially working but in my opinion it's not the most logically correct and then I have another version that I think it is logically more correct but that it's not working at all! Then a bit further they talk about the interface initialisation where is said that properties SDASETUP and SDAHOLD must be set before initialising the device. Y feel sure MCP9808 will need this? But this last version shows nothing on scope! When I search for this register, I see this is an 8 bit register, so I can't write 100KHz there. Why mcu's more and more complex constructed as stupid configuration monsters instead of helping the programmer in an intelligent way? How many working hours were wasted worldwide due to a wrong set baud rate? OK I would like to acknowledge that the new Series-0/1 TWI architecture better automates the processes. I'm not sure so I placed those 2 settings there! Well, I have to admit this is also my first time reading a datasheet and trying to do something from scratch so I might also misunderstanding many things in the datasheet. Probably for someone with some more experience than me, would find the datasheet pretty explanatory. But not me! I need to keep digging! I'm was even trying to split my TWI_Read() function line by line and add each line before the while() loop and use my scope in "Single" mode where it captures the first bits on SCL line to see if anything was going on, but when I place the line of code with the Slave address before the while(1) loop, I can only capture a single transition on SCL line from 0 to 1. Nothing else! I have also increased frequency to 20Mhz/8 and MBAUD to 7. This was supposed to return a frequency of about 104Khz but my scope says about 111Khz. Hope this is not critical! I quoted "But this last version..." Did you not notice that your two code versions differ in this point? Did you not wonder if a "!" could make a difference? You should not develop your code on the scope but with the datasheet. I had to fight with the data sheet for a few days too (please have look for latest version). You have to understand these processes first then the reading in of data is no longer a problem. If details are unclear please ask. I have also increased frequency to 20Mhz/8 and MBAUD to 7. This was supposed to return a frequency of about 104Khz but my scope says about 111Khz. Hope this is not critical! That's all irrelevant now, same with timing parameters in TWI_CTRLA. I need to apologize but as I wait for answers here I'm always trying to change things, read and think about other possible interpretations and therefore, when people replies here and I see the replies, many of the times, my code is already way different than when I posted here my questions. So, about the '! ', of course I know it may change the code dramatically but by the time I read your reply, that '!' was already gone and probably the condition being tested was also different. Anyway, about those schemes/pictures you posted, I think I understand the concept and the order things happens but turn it into code is another very different thing. That has been my struggle so far! And Mr. @GermanFranz, you said you're no expert in C and you don't have to be. I'm not an expert in C at all. This is all about having some background on I2C, I mean, to have done this before and to be used reading datasheets! I'm not comfortable with any of them yet. Just as a note and to give you some context on my (in)experience on the matter, I didn't even know that the way of coding the following directive - ADDRESS + R/W - was by means of a left shift and adding a bit to the LSB position. I interpreted this as adding (due to the '+' sign) 1 to the address of the slave device like 0x18 + 0x01 = 0x19. I now know this makes no sense but when I read ADDRESS+R/W, to me this was always a sum operation, 0x18 + 0x01, read operation, 0x18 + 0x00, write operation. Anyway, a part from this, I'm more interested in figuring out how to make this work. I wanted to understand why one of the versions of the code where I have the TWI_Read() function being called 256 times inside the while(1) is working and I can see the Slave address being sent to the bus and being ACK by the Slave device and when I change the code so that the for loop with the 256 cycles goes inside the TWI_Read() function itself, I can no longer see the Slave address being sent to the bus and ACK by the Slav device. I'm going to place both code online and paste here the links because it will be more easily readable! Code with 256 reads. This loop with 256 cycles is inside th while(1) loop in main() function. This version of the code is the only one where I can see on my scope the Slave address being sent to the bus and being ACK by the Slav address. However, I think this is not the correct way of doing things because it is not supposed that I send the Slave address in each one of the 256 reads. Datasheet shows I can perform as many reads as I like and Figure 24-7, page 339 here. Then I tried to change the code so that the Slave address wouldn't be sent in every one of the 256 loops, by moving this loop into the TWI_Read() function but despite the fact that I think I changed nothing in the way each setting is happening, I can't understand why I can't see a thing on my scope. The only thing I did was to adapt the 2nd version to have the 256 reads inside TWI_Read() function but with this code I can't see anything at all on scope! This is where I need help to try to check where the problem might be. If you have some more questions to "Settings meaning for TWI device" (title of this thread), to twi function or datasheet don't hesitate to ask. Any other code-check its stuff for C-experts here:) The ways of cognition painfully often lead over trial and error, but I think with your patience you will arrive! This is not about C. There's nothing complex in the code. This is in fact all about settings and knowing about I2C/TWI. All C code here is just meaning of settings, knowing when and how to use them. Not anything related to C programming language! Ok, my last post is asking about C but only because I can't spot any big change in the chronology of events and I was hoping someone to help me, but other than that, it's all about settings and I2C/TWI. concrete questions indicate a deeper involvement with the topic. I can not recognize such questions and now I (and probably other people) don't know how can help you. If you want to read several bytes of the slave coherently you must implement the processes according to figure 24-13, otherwise it will not work! I can understand the BUS State, State diagram. Translate it into code is another very different matter. About the other picture, it's confusing to me at some points. I'll try to follow the picture and say how I translated it into code. According to the picture description, light grey diamond shape is something that must be done with code. Dark grey is stuff related to bus state. So, having this said, I start looking to the picture and I see M1. I read about M1 and it is said that it's for a case of Arbitration Lost or Bus Error during Address Packet. But I don't understand this. How can this be an error during an Address packet if, at this point, and according to the picture provided, there is no address byte sent yet? Same for M2 which is described as Address Packet Transmit Complete - Address not Acknowledged by Slave. There is no address packet sent yet so how they say that at M2 there is an address packet transmission complete and not ACK by the Slave device. No sense to me here either! Again, for M3 which is described as Address Packet Transmit Complete - Direction Bit Cleared. How can the Address packet transmission to be completed if, according to the picture, the Address rectangle is yet to come? I can't understand this, at least until here. Then the picture says I need to issue a Start Bit/Condition. The datasheet says that when the TWI0_MADDR is written with the Slave address and the R/W bit, the Start Bit/Condition is automatically issued by the hardware. 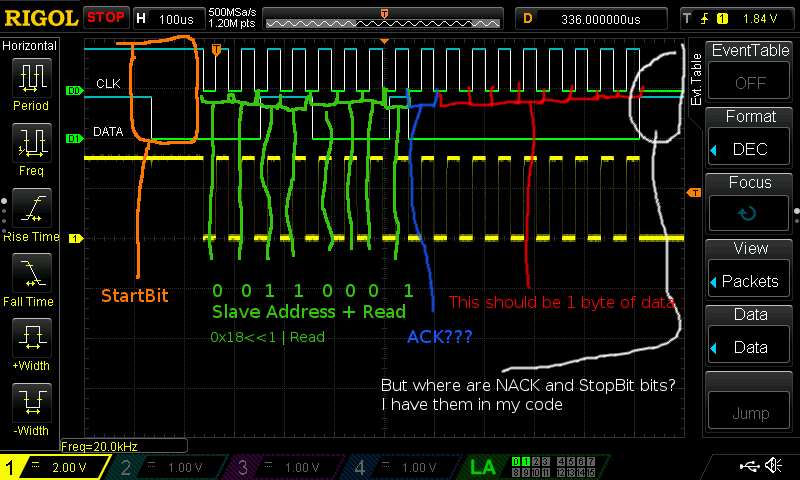 TWI_RXACK is 0 if ACK is signaled by the Slave device and 1 if NACK is signaled. After this, and if I understand the thing, the Slave device responded with the ACK/NACK and I can now read data bytes from the Slave device. But I'm not sure this is the way to read data bytes from the Slave device or if I have to access some specific register directly from Slave device. I really don't know! My reasoning tells me about this picture, that in the case that I only need to read a single data byte, I must issue a NACK from the Master device to signal I don't want to read more data and after that, I must issue a Stop Bit/Condition. So, I acknowledge that I have ignored some aspects from that picture with the M cases and I think I have tried to follow the above frame format for a Master Read operation and still no data bytes can be fetched from the BUS by the Master device! I know Fleury does not support AVR-0/AVR-1 but what it does do is correctly implement the TWI sequence of operation. So I'd study what it does for tiny/mega then simply port/translate that to the AVR-0/1 hardware way of doing things. The higher level algorithm operation will be the same. It looks complicated but in fact it needs less code compared to older Mega-TWI. Let answer me step by step, beginning today with first part of your last posting. 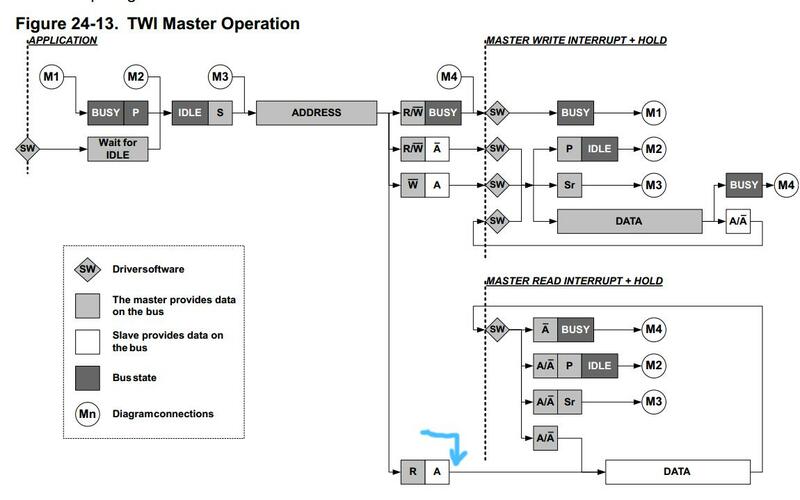 How you have to talk with your Sensor-Slave and how you finally translate everything into c code its your task, but I can help you with the understanding of Master-Read procedere @ figure 24-13 flow- and datasheet. I read about M1 and it is said that it's for a case of Arbitration Lost or Bus Error during Address Packet. But I don't understand this. How can this be an error during an Address packet if, at this point, and according to the picture provided, there is no address byte sent yet? The IDLE status is start point and the prerequisite for a proper procedure. I have to wait until the BUS becomes IDLE. maybe not enough, if there is no bus time-out enabled or stop condition detected you have to force IDLE status by writing to the bus state bits. Or you do same me: Switch off TWI in case of any error and start again: Then bus state must be manually set to IDLE too. Same situation: An attempted address command before! A Master Write ("Error") Interrupt is released. If MSTATUS/RXACK flag not reflects what you need (ACK from slave) you can send stop-condition and after that bus becomes wanted IDLE again! In this case there is most time a bigger problem with slave or i2c address is wrong. This is the case after sending a "Repeated start". Now address have to follow. I not use this feature. Important to understand: Every state machine like TWI has a past and works in a circle. M1-M4 are location points to close this circle only. TWI MASTER INTERRUPT- this is either MRI or MWI, only one can be triggered at the same time. MRI, this also means: No error has occurred! Right! That happens automatically now. If no MWI but first MRI is triggered afterwards: Everything OK! Slave sent his ACK-Bit! More happens: The first data byte has already been read in MDATA too! If Smartmode enabled AND ACKACT=ACK (need more data) then reading of MDATA causes: ACK will be sent automatically, next data from slave will be read into MDATA, followed by NEW MRI. you can summarize this code in 1 line / 1 instruction. This is quite a bit of information to digest. I'll try to see what I would change in my code after reading your post. This is going to be an endless journey of questions. So you say that waiting for the BUS to become IDLE may not be enough and then you talk about BUSERROR or ARBLOST being set in MSTATUS. In such a case you suggest to turn OFF and then turn TWI ON again, right? to wait for the BUS to become IDLE. And handling BUSERROR and/or ARBLOST should be after or before waiting for the BUS to become IDLE? BUSERR & ARBLOST are symptoms of status BUSY. Have look in Fig. 24-12 how you can come back IDLE. In such a case you suggest to turn OFF and then turn TWI ON again, right? Not only in such a case- at any error. This maybe not the best recommendation (with aborted transactions you lose communication speed) but it simplifies and saves code. In practice, I had so far no bus problems and big challenges with only one sensor I ask every second and a short cable. Remember that arbitation lost problems you can get only with more than one master device on the bus. And "an illegal bus condition (BUSERR) is detected if a protocol violating Start (S), repeated Start (Sr) or Stop (P) is detected on the bus lines" (Datasheet S.365). With only one master and own software such errors should be excludable. With short connection lines and matching pullups, the right i2c addresses and working sensor(s) its a surefire thing! Don't be too worried. I saw only one time a i2c device is crashed in a way that no more software, only a power-reset helped. And handling BUSERROR and/or ARBLOST should be after or before waiting for the BUS to become IDLE? Writing 0x1 to BUSSTATE bits forces the bus state logic into its IDLE state, the next software operation of writing the MADDR will clear both flags. 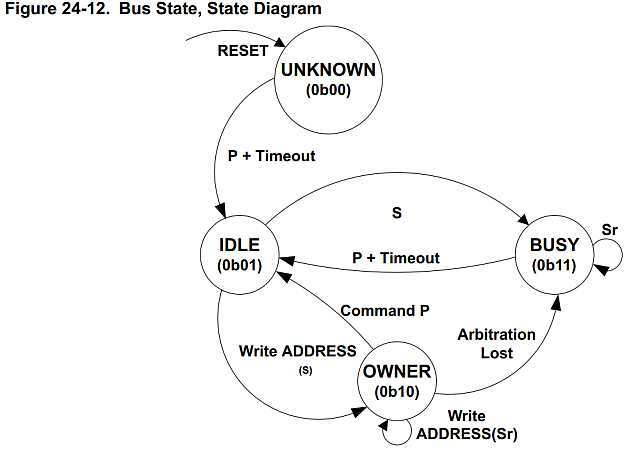 Recover from BUSY back to IDLE, according to that State Machine diagram is only possible with a Stop Bit/Condition + Timeout. This is another thing not making sense to me. At the beginning of TWI section of the datasheet, it's said that TIMEOUT must be disabled for TWI operation. Ok. I have to understand and re-write the code in such way I can re-Enable TWI device in the correct timing. That violation you refer to, is related with electrical interference and other phenomena not controlled by us or what kind of violation we might be talking? And btw, I'm using a small dev board so I'm not using wires or cables. So connections are what they are. The shortest possible, I presume! Yeah, I have read that info many times also in the datasheet. If BUSERR or ARBLOST are detected, I disable TWI, wait a small amount of time (not sure this is needed), re-Enable it and set the BUS state to IDLE manually. But I placed this piece of code after the while loop waiting for the BUS to be come IDLE at the beginning of my TWI_Read() function! But at this point, I'm not sure the while loop waiting for the bus to become IDLE is still necessary or not. At the beginning of TWI section of the datasheet, it's said that TIMEOUT must be disabled for TWI operation. Right. Usable or not - I do not know either. But no problem, we not need! if there is no other master, all connections OK and i2c devices not faulty. This is caused from other masters or wrong commands you send to the bus (for example only start+stop). How can he use that code ????!! that code does a completly different task. first, this helpful instructive code does not just show the initialization and second, it would be nice if you could offer specific help on the subject here. Your objections, however, do not make much hope , or? I0ve changed a few things but I can't see on scope what I was expecting. I haven't seen that code yet. But to go through it I need also to take a look at that chip. Once again: TWI its the same! Completely. If this C-Code is working on ATTiny402 and an ATTiny416 you can use same techniques, same code for read/write access using Mega4808. Please read again what is "task" of this thread. Ok, I guess I'll have to give it a try! Finally back to my TWI thing. I've been looking to the code in those 2 files. I have some questions because I'm not sure if things are the way I'm thinking they are! I'll go through each code regarding each question. First question is why there is this TWI_Start() function and then one other for the Read operation and another for the write operation? I had created only the TWI_Init() and then the TWI_Read() functions. Is this "Start" function mandatory? Then, I don't understand why there is an ACK signal being sent if the BUSSTATE is different from BUSY... Can you please explain me why? Then, I don't understand why there is this IF with "addr & 1 ". What is the purpose of this? If this is to set a READ/WRITE operation, then, why are there specific functions for the same Read/Write operations? Also, RIF and WIF, according to the User Manual, says that these bits are set when a Read or Write operations are successfully completed. But this function has no code to read or write anything from/for the BUS. So why is this code inside this function? Or am I getting all wrong? Yes, you have already suggested to study Fleury's code and try to start from there, but at this point, I want to try the other suggested code! I was just trying to understand how that code works so that I can use it properly!